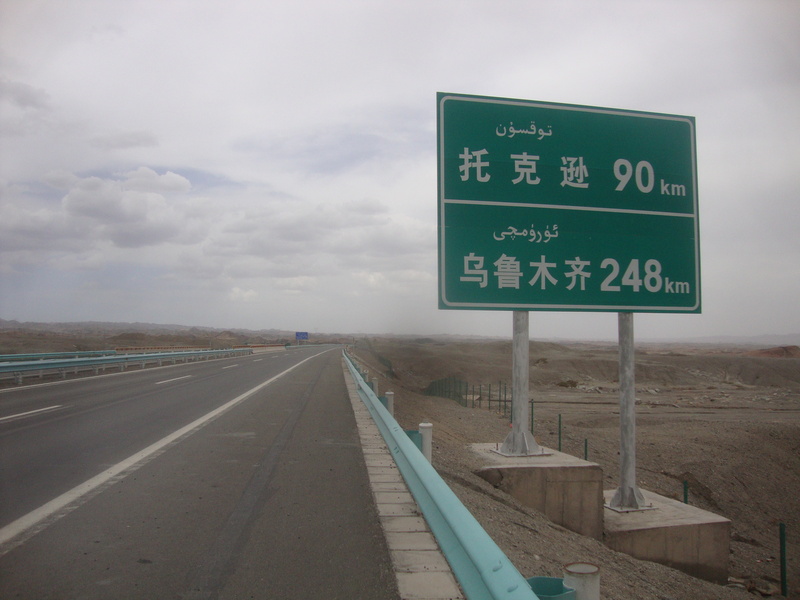 After Kashgar comes the Taklamakan Desert. It is not, as they say, a walk in the park. It has been remarked upon that I focus rather a lot on pain and suffering in some of these blog posts. And yes, this has not escaped my notice. What I’ve also noticed, however, is that the difficulties and challenges of this trip, and the days where I plod along feeling like I really can’t go any further are, for me, one of the most fundamental parts of this journey, and strangely also one of the most satisfying. I’m rather surprised to find that I’m such a masochist, but there seems to be no better definition. Not all people cycle round the world for the same reason. Most of the other cyclists I’ve met consider travel their main priority, or have some other overriding project, like photography or education, and cycling is just the means they’ve chosen of doing this as cheaply or as thoroughly as possible. But in my case the urge to cycle was there long before the urge to travel. And, even though there are many sides to this journey, and many aspects of it – the people I’ve met, the mountains I’ve seen, the food I’ve eaten – have exceeded my expectations, at the core of it, I am a cyclist. I happily and obsessively cycled round London before I started to cycle round the world and, no matter what I end up doing when this is over, I am pretty sure the bicycle will be at the centre of it. But of course, cycling isn’t supposed to be painful, and I am probably doing the sport a great disservice by dwelling so much on this aspect of it. After all, one of the things that’s kept me in the business for so long is the overwhelming joy I used to experience when I danced through the streets of London as a cycle courier. That joy isn’t as regularly in evidence now that I’m cycling round the world. But it’s been replaced by an immense contentment, and I feel this contentment even on those days where I’ve ridden 100 miles into a headwind, fuelled by nothing but bananas and stale bread, and pitched my tent in the car park of a petrol station (and, owing to a moment of stupidity with my Leatherman a couple of weeks ago, my Thermarest mattress no longer holds any air, making these concrete sleeping arrangements even less comfortable than they used to be). I’m having trouble explaining this feeling, even to myself, and was both mystified and dismayed when I realized how much I thrive on difficulty and discomfort – because I still have all the contradictory couch potato impulses of every other human being, and unless I prod myself into action, will easily spend days sitting around eating, drinking and doing nothing (which is exactly what I’ve been doing for the past week, in my friends’ comfortable flat in Urumqi). But I understand ever more clearly that this lethargy and luxury is not going to make me happy, and that a couple of weeks of physical exertion and hardship will, so at some point I’m going to have to leave it all behind and get myself back on the road. And for the next few weeks, the road promises to be as inhospitable as anything I’ve experienced so far. 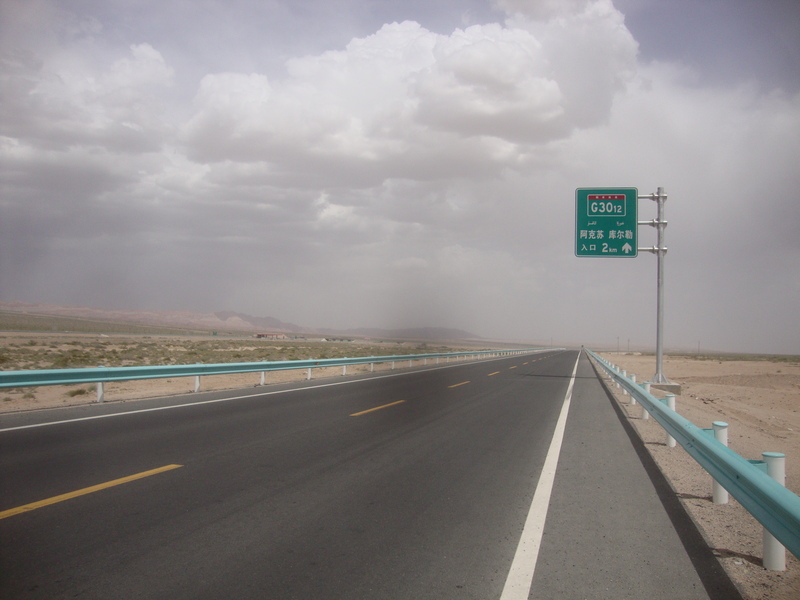 Since I left Kashgar I’ve been following Highway 314 through the desert. The road has recently been upgraded and widened, so it’s a far cry from the rough tracks that former generations of Silk Road travellers had to endure. There’s fresh tarmac and a nice wide hard shoulder. But that’s where the cycle-friendliness ends. Xinjiang’s more minor roads tend to be lined by small villages, groves of poplar trees (even out in the desert) and frequent cold drinks stalls. Highway 314 runs for over 1500km (I know, because there are distance markers every kilometre) through rocky desert the colour of concrete, and for most of its length it’s hemmed in by a barbed wire fence, ensuring that tired cyclists can’t wander off into the desert to camp, even if they wanted to. There’s more than 100km between service stations, and most of these are still building sites – the first one I visited had cold drinks for sale (hurrah! ), but the next two couldn’t give me anything more than hot water, although one did let me camp in the building they were putting up. They hadn’t fitted the doors or windows yet, and it was blowing a gale all night, so I was hardly better off than I would have been outside, and woke up with my tent covered in sand and brick dust. The road was clearly built for cars rather than bikes, and for me it heightened the contrast between my mode of transport and everyone else’s. Highway 314 is more like a pipeline than a road, designed to funnel people from city to city without any engagement with the countryside they’re passing through. To be honest, there wasn’t much to engage with, although, owing to the scarcity of civilization along the way, whenever I did reach a police checkpoint or petrol station (often only once a day) I took full advantage. Many of the people staffing these outposts were clearly stationed there full-time, sleeping in rudimentary dorms, and were delighted with the distraction occasioned by my arrival. No one ever had any problem with letting me camp (including the police, although technically I shouldn’t have been there, as there were ‘no cycling’ signs all over the entrances to the road), and they would usually insist I join them for dinner and breakfast. When Michael arrived at the first service station a few days later, he was shown a video someone had made of me raiding the cold drinks fridge. The weather’s getting ominously hot, though the temperatures are still generally bearable, especially since I spent most of the last two weeks being fanned by an almighty headwind, which stirred up the dust so that the sky became the same muddy concrete colour as the desert. I didn’t really mind. It’s easier to ride without the sun beating down on you, and I was usually happy to put up with the headwind, since it took the edge off the heat. Still, by the time I reached Urumqi my face and hands and feet had swollen to unrecognizable proportions. The main problem was the boredom. You get an awful lot of thinking time on the bike, and I normally manage to fill this amply, with memories of times gone by (both the early days of this trip and my long-lost London life), fantasies of times ahead (like when I ride triumphantly back into London and am garlanded by the Queen, for example) and mullings-over of all the news and gossip I receive in emails from my nearest and dearest. But after nearly two weeks of riding through a monotonous greyish-brown landscape, with nothing but my own company for entertainment, I realized that I’d run out of things to think about, which made the last couple of days into Urumqi very long indeed, since by then I could really have done with something to distract me from the raging saddlesore. And there’s worse to come. 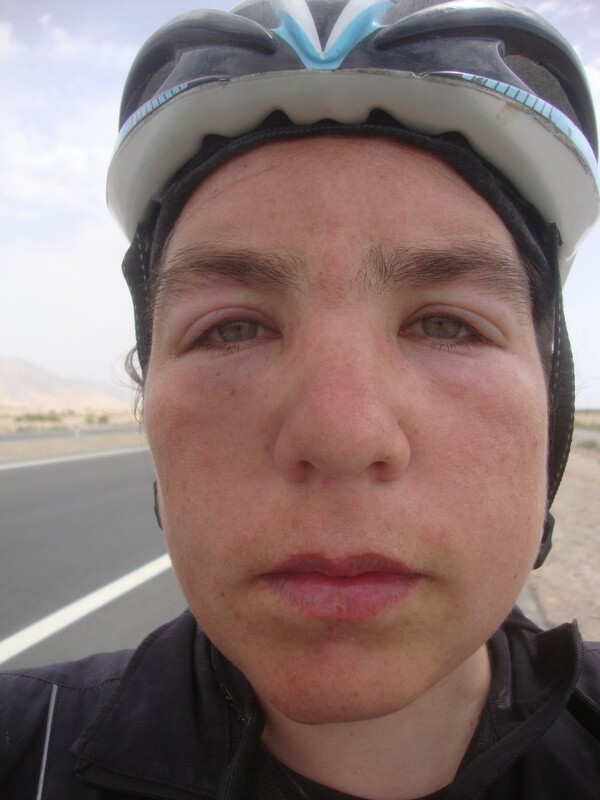 I spent a few hours yesterday doing my homework, which involved browsing through the old blog posts of Sarah Outen, who rode this way last summer, when I was still sitting around in London looking at maps and buying bike parts. 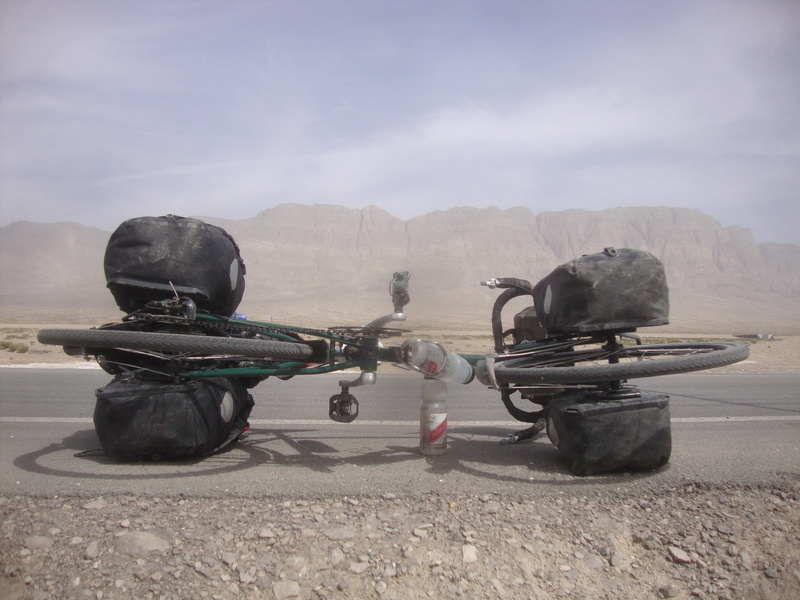 As I may have mentioned, Sarah is one of my heroes, and I found her account of riding through the Gobi Desert a strange mixture of exciting, inspiring, disheartening and downright terrifying. And just look at that headwind. 60km in 15 hours! 30km in 9 hours! What also stands out is Outen’s incredible ability to maintain a positive attitude in the face of all these trials. Expedition not a holiday, remember that. Where else would I rather be? Nowhere! I’m happy being right here! I’m sure those words will be running through my mind in a week’s time. Oh no! That looks painful and difficult. You won’t be able to do it. Ah, but you probably will – and that’s the really scary thing, because it means you actually do have to go through all that pain. Oh dear, but what if the pain gets too much and I give up? I’ll never forgive myself. But look – Sarah Outen did it last year, and she’s a human being with arms and legs and ovaries, just like you. So it’s possible. But she’s Sarah Outen – she’s not built like mere mortals. Just look at her riding through the night with only an hour’s sleep! Well, that means that if you make it, maybe you’ll be as impressed with yourself as you currently are with Outen. Pffft, that’ll never happen. Maybe the wind will be weaker this year. Maybe I’ll only manage 2km per hour, instead of 3km. Don’t be silly. 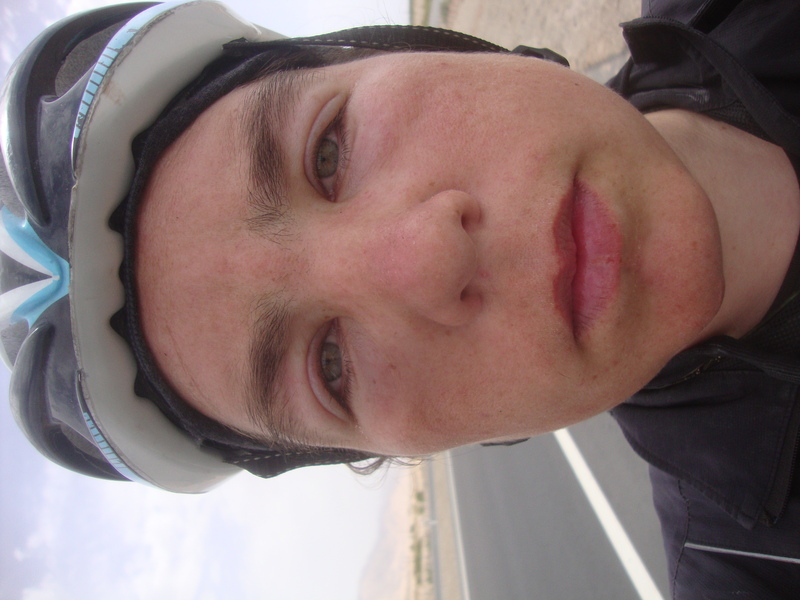 And if Sarah Outen was only able to ride 30km in nine hours, that means it really is difficult, and you won’t need to beat yourself up about riding slowly. Oh, but I will. This much is certain. Well anyway. Just get on with it. Outen lived to tell the tale, and so will you. And you’ll forget the pain. But curiously, intermingled with all this fear and self-doubt is a very real sense of anticipation. And, like Sarah, I find constantly that there’s nowhere else I’d rather be. I still can’t quite explain it, but I’m going to keep trying.